You are here: Home / What Are The Exact Costs Of A VA? 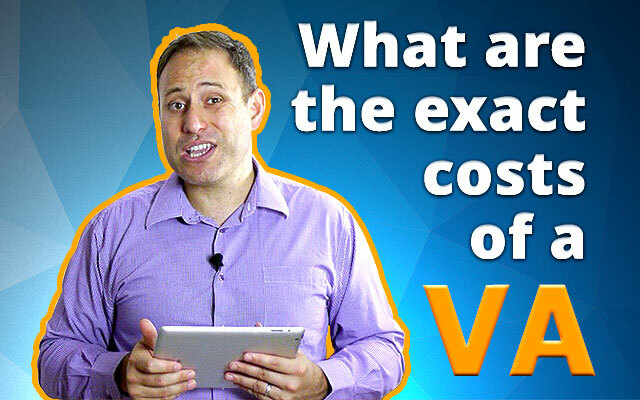 What Are The Exact Costs Of A VA? When it comes to employing your VA there are additional costs that you need to consider that are above and beyond their hourly rate. If you employ people locally you’re generally aware of what those costs are and exactly what you should and are not responsible to pay for. In today’s conversation we share those additional costs and what you should pay for to ensure you keep a long term employee that is prepared to grow with your business. Hey David Judge here and today we’re going to discuss What Are The Exact Costs Of A VA.
Now, we’re talking about more than the hourly rate you pay, we’re also going to discuss what other costs there are associated with a VA and whether or not you need to pay those costs. In this conversation we’re really going to talk about this as a sliding scale, as people think the more you pay the better the person you’ll get. While this can certainly be the case, you need to ensure you are ticking the boxes as to where that money is going and whether a person is going to offer that return on investment for you. I’ll explain that as we go through. Ok so, lets talk the costs. As long as your VA has these 3 items they can perform the task for you. What I have found over my time in outsourcing is if you want to attract good quality people whilst you can look for a person that ticks those 3 boxes then there are other areas you need to cover. Now you notice I just said GOOD QUALITY PEOPLE? Whist you can strike it rich and get a good VA out of the blue, if you want to focus on consistently getting quality people these are the 3 areas of fulfillment you really need to cover. I’m going to break these down, explain why each fit into the overall puzzle and finally how that impacts the exact costs of a VA.
One last shameless plug point I would like to make… When our clients work with us, all of these costs are calculated into their investment of employing a VA. Employing a person on oDesk or the like is simply not enough for you to sustain an VA on the medium to long term. This is sort of like employing a person full-time locally where there are other areas you need to pay. Those are the key areas around security you should cover with your team member. As we said earlier, the minimum a VA needs to have in order to work was a computer, internet and power. Whilst this is the bare minimum, if you want to achieve the maximum results for your VA and ensure they are not getting distracted then you need MORE. The average case scenario (notice I mentioned average case, as opposed to BEST CASE) would be an office space with adequate lighting (so they’re not working in the dark), air conditioning, a desk, a chair, no sound distractions (like sound proofing) and within a team environment. Each of these areas allows your team member to feel valued and (as you would expect) I have noticed a HUGE difference in the level of performance of a person working within an office space, as opposed to a working from their bedroom. From my early days in outsourcing I’ve always thought how I could improve my outsourcers skill level as I understand the more they know, the more I can delegate. It turns out this had a flip side effect. It actually meant they felt happier in their role and they really wanted to be there as they knew they would be learning new tasks all the time. Once this dawned on I realised I needed to ensure every team member is cross skilled and upskilled in different disciplines and skillsets. When I started rolling this out it allowed me to identify particular tasks that particular VA’s excelled, which allowed me to start directing people toward the tasks they enjoyed. The result as I mentioned earlier is a culture of personal development and when a new team member is added to the team and I ask for feedback, they comment that it feels less like a job and more like I’m constantly growing. Now, this also extends beyond upskilling in work disciplines and I have noticed a massive uptake when I entice team members with Gym memberships and I tell you now if you want a highly skilled loyal employee for life, simply look at this 3rd point ALONE. Ok, these are the 3 areas and what you’ll need to calculate as the EXACT COSTS above and beyond your hourly rate to grow your team. This is also why I am constantly employing other people’s VA’s (especially from a job security perspective) and why I’m able to provide clients with consistent results. Awesome, another juicy subject and let’s wrap up. In the next session we’re going to discuss How to integrate a VA into your team. We employ VA’s for clients that are looking to add that additional level of support for their team so we’ll cover off how that looks and give you a couple of scenarios so you can get a feel on how it may apply to you. If you have a question you would like me to answer make sure you get in contact and I love to hear from you. As always this is David Judge talking outsourcing and showing businesses how to work smarter. http://davidjudge.com/wp-content/uploads/2014/11/VA13YouTube061114Thumb-optimized.jpg 400 640 David Judge http://davidjudge.com/wp-content/uploads/2014/08/David-Judge-Logo_.png David Judge2014-11-06 10:08:112016-03-17 03:19:21What Are The Exact Costs Of A VA? To access this very special report, simply enter your details below and we'll get it out to you right away.